Released in 1998 and featured a much wider assortment of unique tracks than the original and a full stunt mode that included scoring for multiplayer. Rush 2 is the sequel to San Francisco Rush, and was released two years after the original. 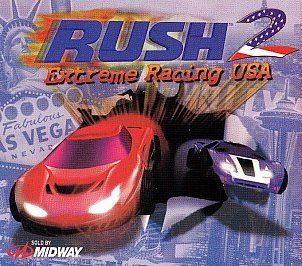 However Rush 2 was released only as an Nintendo 64 whereas San Francisco Rush was first released in arcades to later be ported to the Nintendo 64. Rush 2 was not restricted to the San Francisco environment for tracks because it covered a wide variety of United State's locations. It also had additional modes that could not be found in the original Rush. Rush 2 followed closely to the formula set in the original. The cars handle with exaggerated physics that allow the player to race as well as experiment in the environments. That tracks are set in locations such as Hawaii or Las Vegas, and hold many secret paths, locations and landmarks to discover. The player could choose to race under a time limit alone or with three other players. Also you could drive around tracks without a time limit, to encourage exploring and performing stunts. The game has one mode that truly sets it apart from the original, and that is a stunt mode. In this mode you are given a sort of playground filled with ramps and obstacles. The object of this mode is to set up jumps, and accumulate points for executing stunts. The mode has a two player splitscreen for players to compete in. Two player is timed and the winner is decided by who accumulated to the most points during a round. Copyright © 2019 Ocean of Games.